The full view of parcels and property taxes within Pilsen are for Cityscape Pro and Cityscape Permits members only. 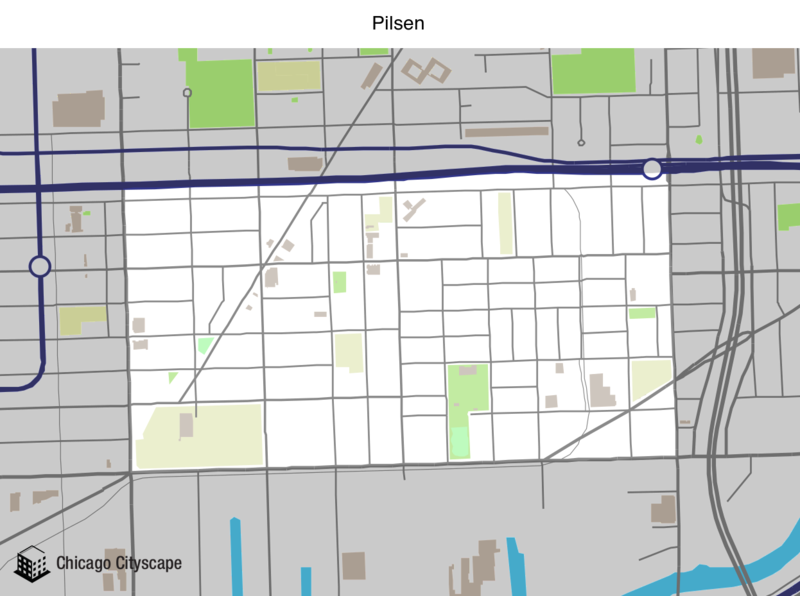 You're free to use our static map of Pilsen, but please attribute Chicago Cityscape and link to this page. The area of Pilsen is 0.5315 square miles. Want to know what you're allowed to build in Pilsen? Order a Zoning Report instantly from MAP Strategies. Submarket 2 consists of urban and suburban homes built before 1940 in parts of Chicago, Aurora, Elgin, Joliet, and Waukegan. Declining incomes likely influence the high and increasing levels of cost burden. Low transportation costs moderate concerns about high levels of cost burden. Many households rent, but comparatively fewer live in subsidized units than in submarket 1. The submarket has higher levels of foreclosure activity, but moderate levels of vacancy. Mortgage investment is low but cash sales are high, which when combined with the high foreclosure rates and low vacancy rates, points to the transitioning of homes from owners to renters. The larger households in submarket 2 frequently have children under the age of 15. Rapid population growth since 2000 defines this submarket. In fact, it is the fastest growing of all eight segments tracked in this study. Submarket 7 primarily consists of exurbs in McHenry, Kane, Kendall and Will Counties but also includes the downtown core of Chicago. The housing stock in the exurbs is primarily low density and has few rental units. Housing in Chicago’s downtown core is a mix of high rise owner-occupied and rental units. The shared traits of recent growth and expansion help to define this submarket, but there are big variations in data. High transportation costs in the fringe areas of the submarket contrast with the low transportation costs found in the core of Chicago. Despite strong market conditions before 2008, moderate levels of lending, foreclosure activity, and distressed sales are present in the exurbs. Overall, the submarket typically consists of middle to higher income households with children and a relatively high level of educational attainment. Show a map of all the Places that overlap Pilsen, including ZIP codes, Census tracts, legislative districts, and TIF districts (this may take awhile if Pilsen has a large area).